"Everyone is a Winner at Sunset Lanes!" 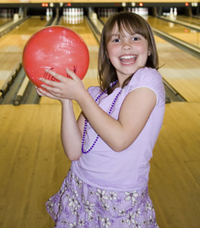 We are dedicated to providing safe and fun place for children of all ages to come and enjoy bowling. We have two great youth programs to choose from and we also have a Youth and Adult league for the whole family to enjoy! Children love to bowl! Register your kids for our Youth Bowling League today! Call (314) 961-2777 for more information. Our Youth League bowls every Tuesday at 3:30 PM. If you are a new bowler, there is a $5.00 registration fee that includes a USBC bowling shirt and three free games of bowling. With our Youth League you are welcome to join anytime during the season. There is also a weekly $7.00 fee for three games of bowling. Call 314-961-2777 for more information.